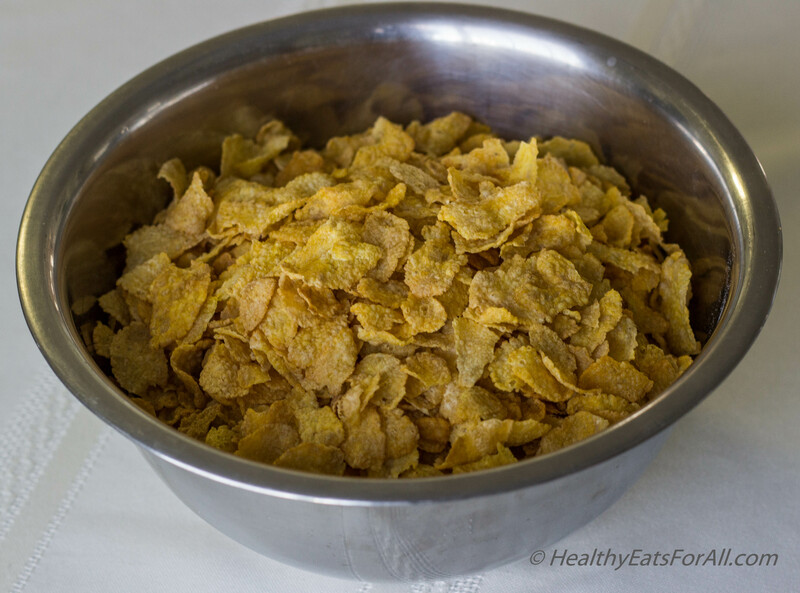 Sometimes I just get these cravings for a cold, crunchy, refreshing bowl of cereal! 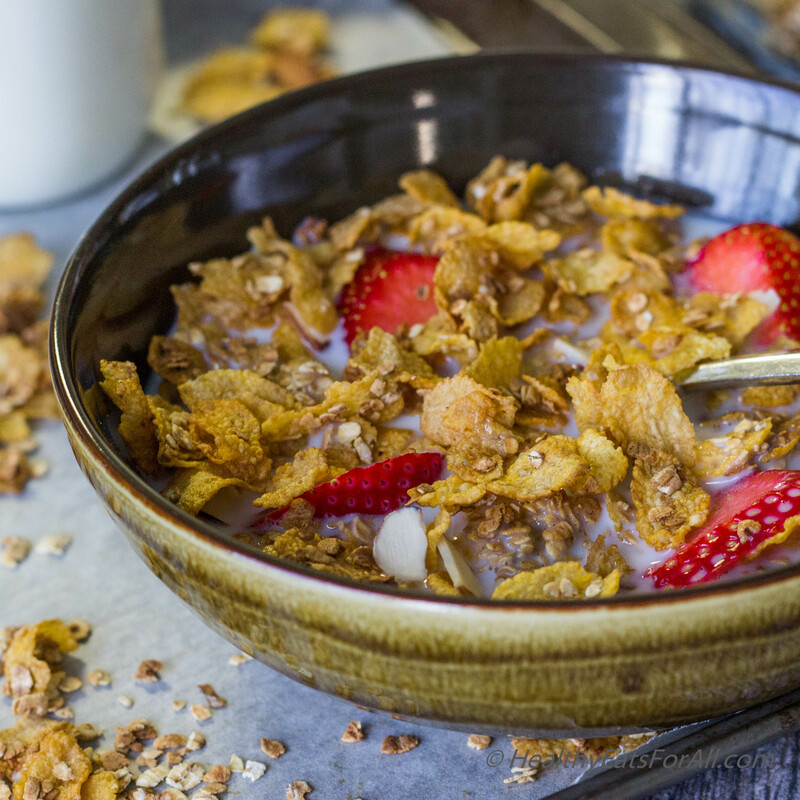 Apart from being one of my easiest go-to breakfast foods, it’s perfect for an after-dinner snack or a comforting pick-me-up in the late afternoon. 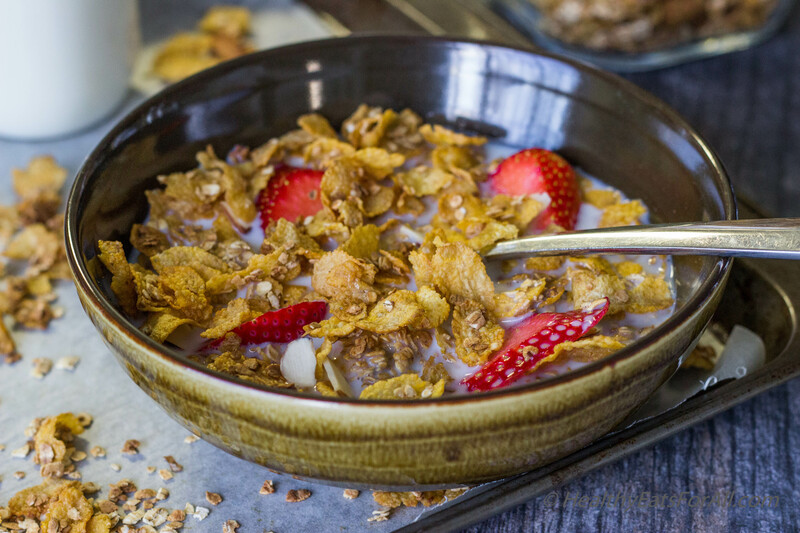 My personal favorite type is Honey Bunches of Oats – it’s extra crunchy, has just enough sweetness, and tastes good even without milk! But like most comfort foods, it isn’t perfect. It’s processed, and has preservatives. So if you’ve been following my blog, you know what comes next: an easy, homemade, healthier version! I have experimented with a few versions and this one, according to me, tastes closest to the one you can buy at the grocery store. Sometimes, I add a pinch of cinnamon if the mood strikes, but that’s completely optional. If you do choose to add it, make sure it’s a very tiny pinch, otherwise the cinnamon flavor will overpower everything else! To sweeten it, I like to add a mix of honey and maple syrup instead of regular sugar to keep everything natural. Finally, I like to add cold milk and top it off with sliced almonds and strawberries! My daughters prefer to add sliced bananas and raisins 🙂 I hope you enjoy, and let me know what you think in the comments! 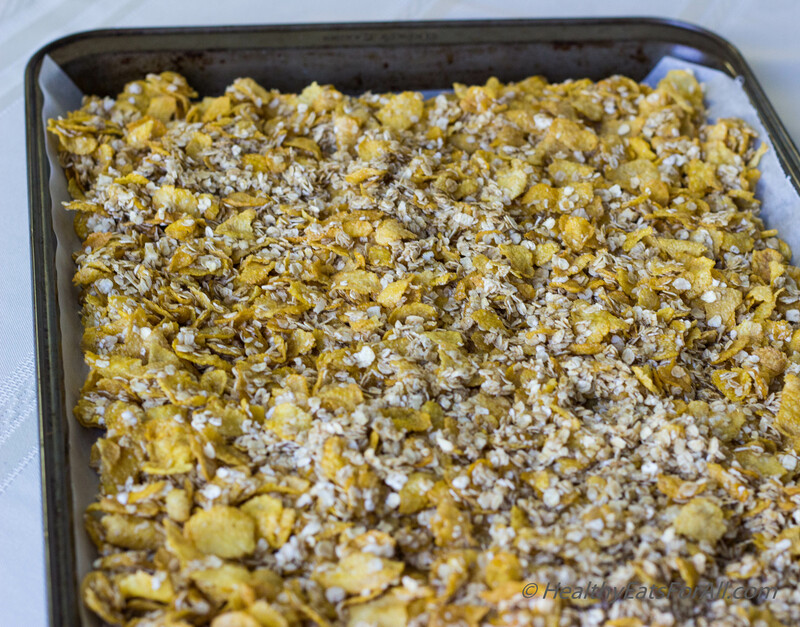 Set the oven to preheat at 300 F.
In a bowl mix the quick oats, corn flakes and just a tiny pinch of cinnamon if you want. 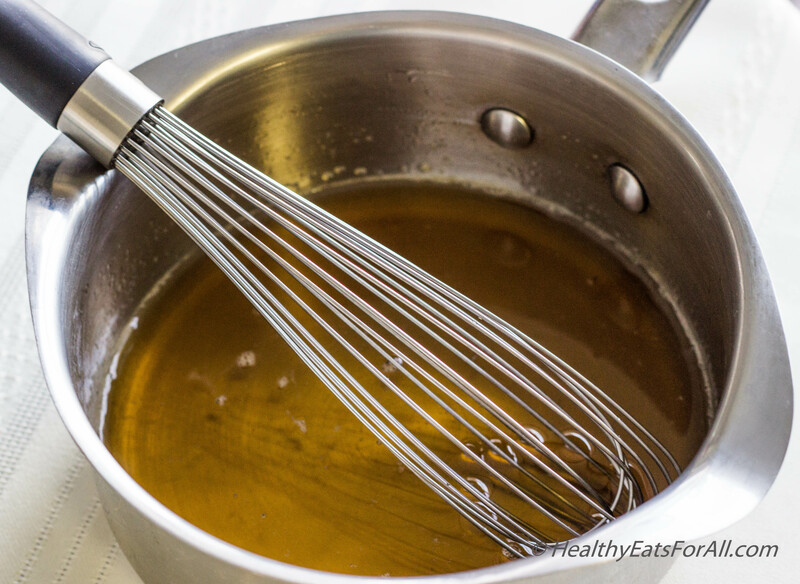 In another bowl mix the honey, maple syrup, vanilla extract and water with a whisk. If using brown sugar you might have to warm the mixture a tad bit for the sugar to dissolve. 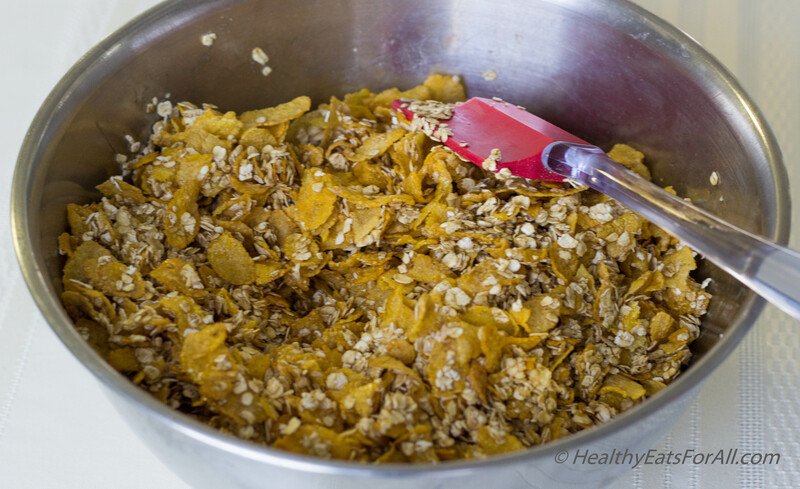 Add the liquid mix to the dry mix of oats and corn flakes. Mix really well. 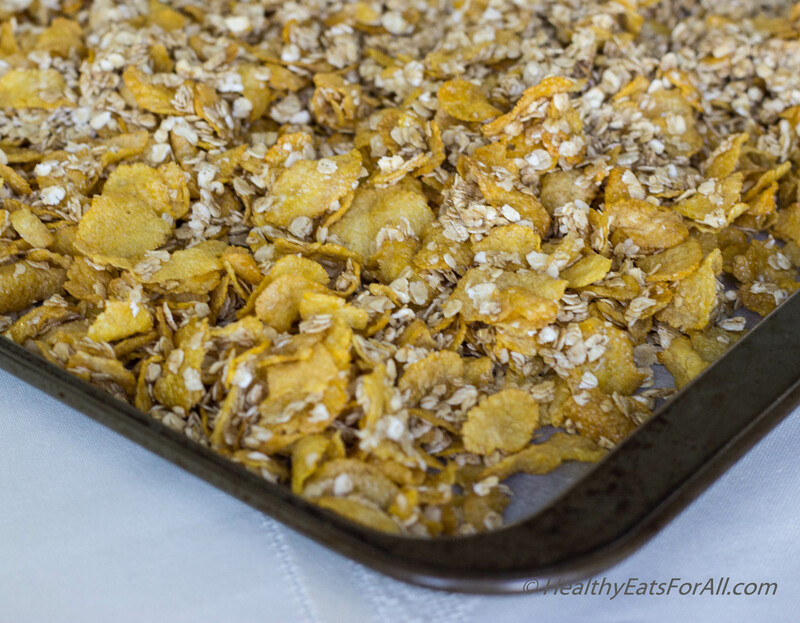 Take a 12” x 19” or a bit larger baking tray, place a parchment paper on it and spread the mix on it. It should not be a very thick layer. Bake for 30-35 minutes. Stir after half way through so edges don’t get burnt. 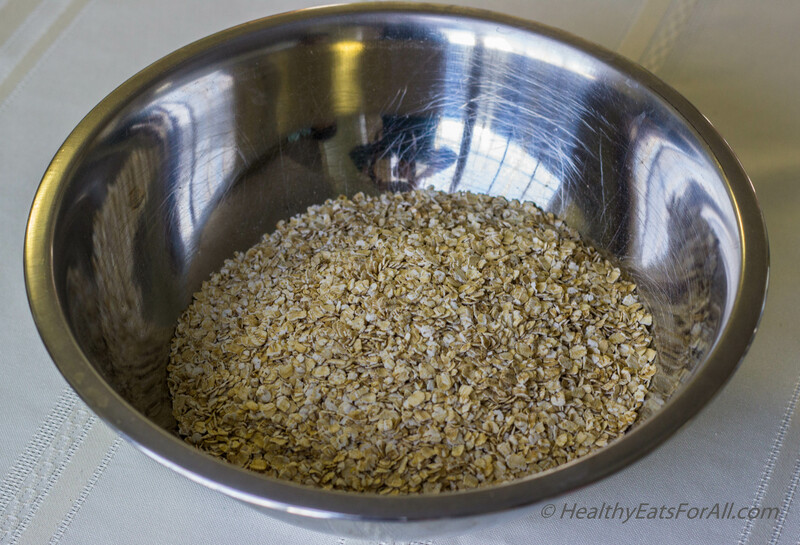 Let it cool outside for 4-5 hours and then it can be stored like regular cereal. 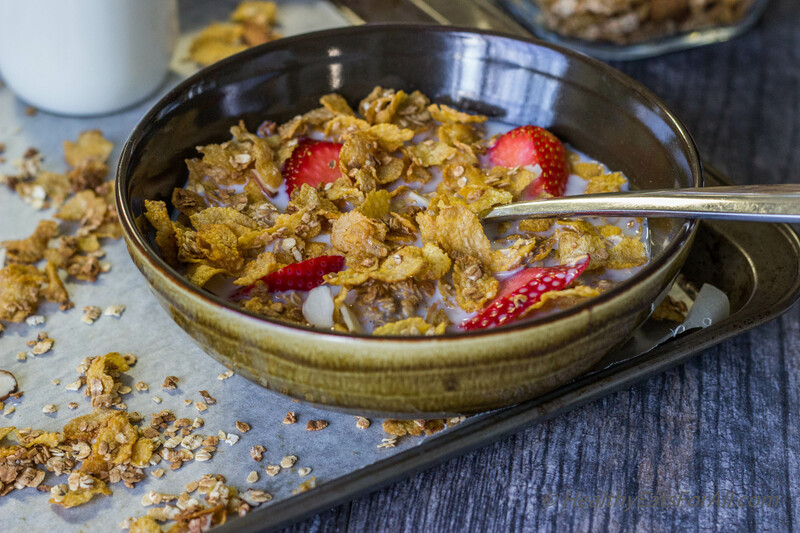 You can add whatever toppings you like sliced almonds or walnuts, dried cranberries or blueberries or raisins, even fresh fruit like strawberries or blueberries. 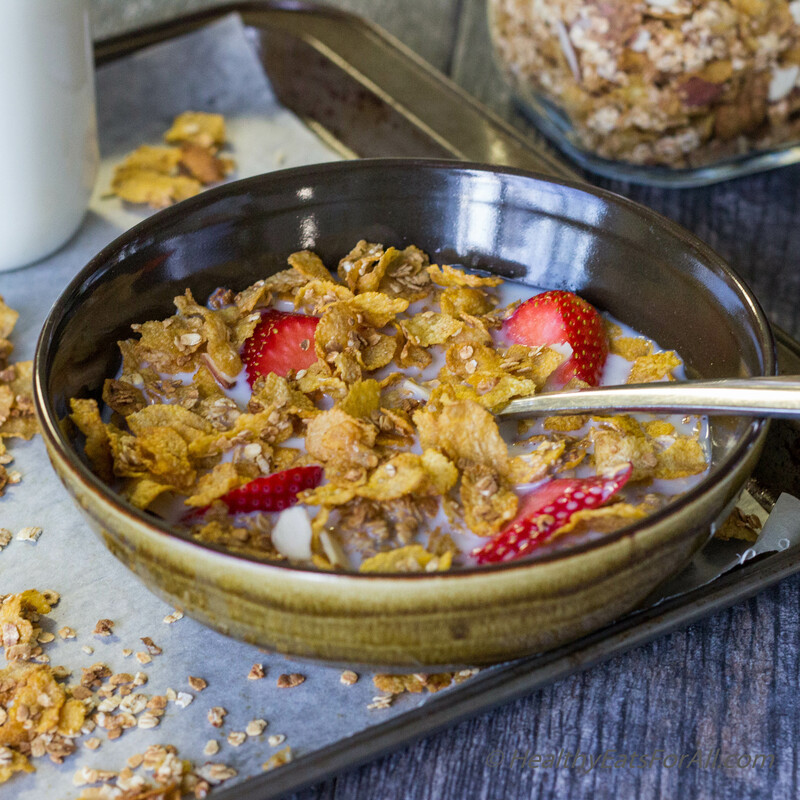 Enjoy as it is or with some fresh cold milk or even over Greek yogurt! I was wondering about the Corn Flakes used. Are they all natural and if so, where do I find them? 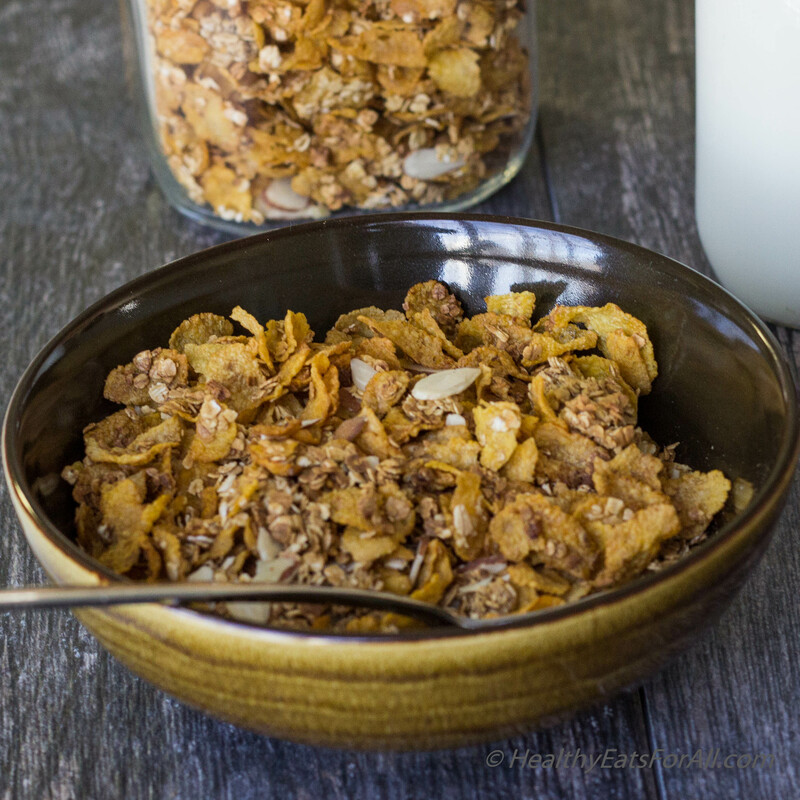 My picky eating son LOVES Honey Bunches of Oats and I would love to be able to make him a better option. Thanks for the recipe! !I have to be Gluten free and one cerealI really miss is Honey bunches of oats. So excited that I can make it now ! Thank you !! I just found this! I’m so excited to try it!! 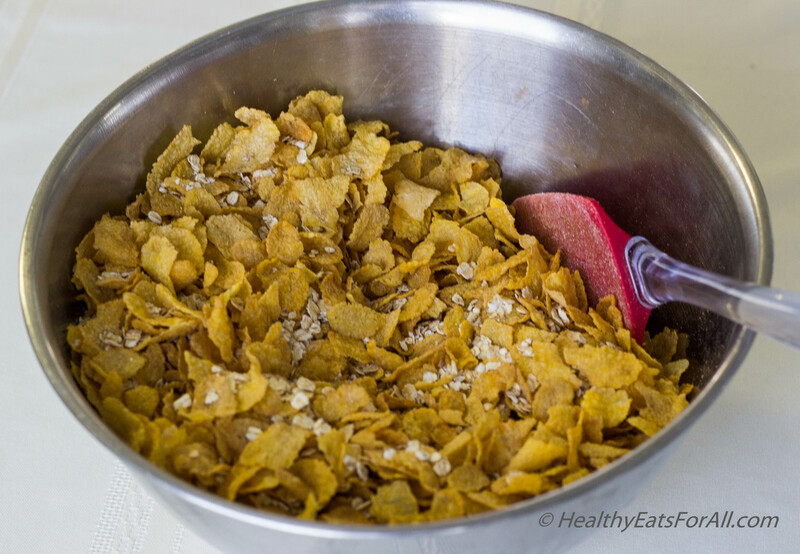 I love Honey Bunches of Oats cereal and so do my kids but would love to avoid a lot of the ingredients used. Thank you!